We service and repair all makes and types of air compressors and Haskel booster pumps. The various types of compressors that we service are Rotary Screw Oil Lubricated, Rotary Screw Oil Free, Piston Lubricated Compressor, Piston Oil Free Compressor. 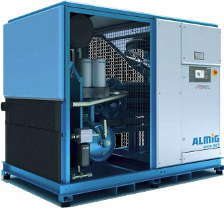 We also service all types of Air Compressors with pressure ranging from 7 Bar To 300 Bar. All our Staff are factory trained and certified for high pressure work.